AMC has released online the first five minutes of the Season 9 premiere of its zombie-apocalypse drama The Walking Dead. The clip takes place 18 months after the war between Rick Grimes' (Andrew Lincoln) group and the bloodthirsty Saviors has ended in rural Virginia. In this new era of relative peace, crops thrive, new construction is underway, a toddler paints and solar panels and windmills generate energy. 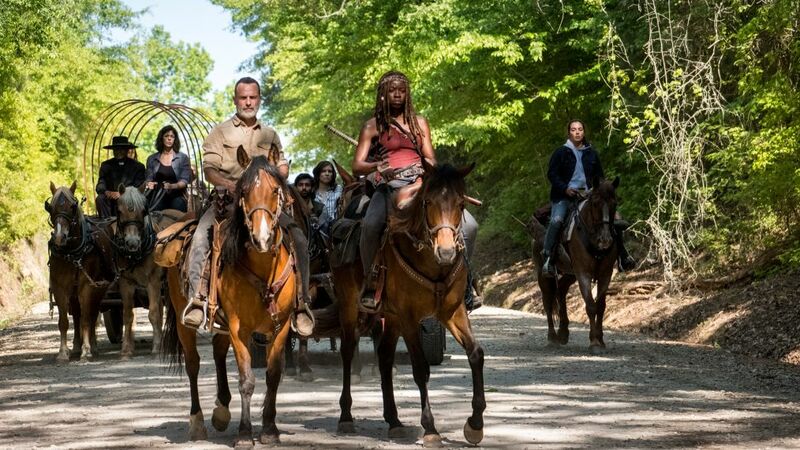 The beginning of next Sunday's episode also shows the survivors communicating with walkie-talkies and riding horses as they try to coordinate their efforts to protect their community from the undead. The video wraps with most of the main characters — Rick, Maggie (Lauren Cohan), Daryl (Norman Reedus), Michonne (Danai Gurira), Carol (Melissa McBride), King Ezekiel (Khary Payton), Jadis (Pollyanna McIntosh), and Gabriel (Seth Gilliam) — arriving in the decimated city of Washington, D.C.